​Queens Alumni Reunion, and More! Students pose for a quick photo after a regular dinner gathering in uptown Manhattan. Greetings in the name of Christ! As I write to you, I am newly returned from maternity leave. I am grateful not only for the chance to have spent these last months caring for my newborn son, Harry, but also for the opportunity to come back to our campus ministries with fresh eyes. I hope you will join me in catching up through the articles below on all the amazing things the Holy Spirit has been up to among our young people this fall and in rejoicing in the gifts they bring to the Church and our world. As always, thank you for your support. Your prayers, volunteering, and financial gifts are touching students' lives in profound ways and I am so grateful. If you haven't yet made a donation to support campus ministry, I invite you to consider doing so today. Together, we can build up big hearted, open-minded campus ministry communities in NYC and transform even more young people's lives with the gospel. Rain didn't stop retreat goers from enjoying a brisk fall hike! 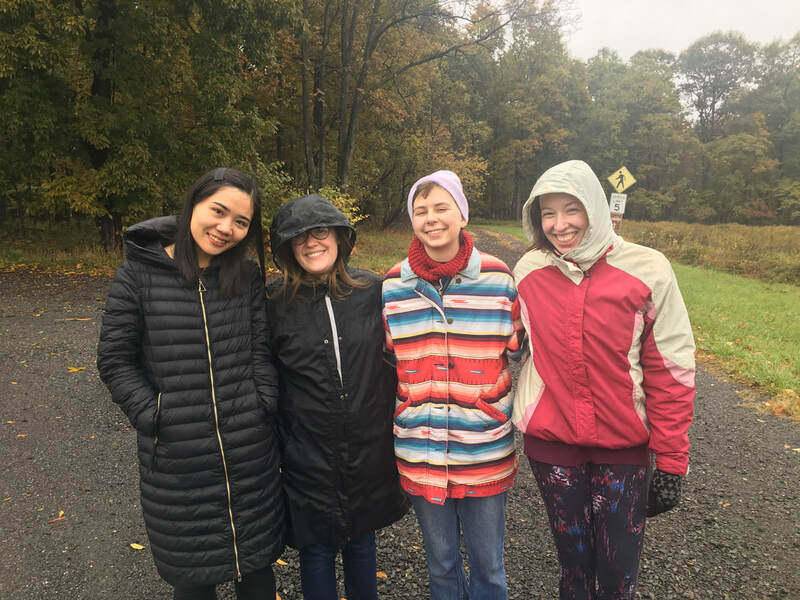 On the weekend before Halloween, when students were hopefully taking a little break from midterms and school stress, The Vine citywide community headed out to Cross Roads Retreat Center in northwest New Jersey for a weekend of rest, fun and spiritual engagement. 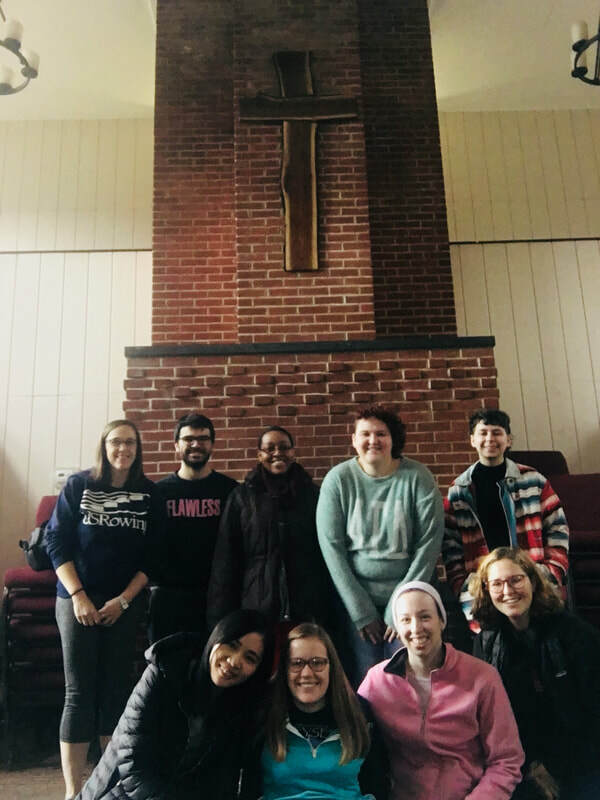 The theme of the retreat was "Sacred Stories" and over the course of two days, students explored how God's Word is incarnate in the stories of the bible, in the "secular" stories they love and in their own stories. Instead of telling spooky tales around the campfire, students spent time reflecting on the stories that have shaped their lives. Each of the retreat-goers first shared a story – be it a book, film, song or poem – that had led them to glimpse the divine. Later, students told their own stories about moments of courage where God gave them the strength to be braver than they imagined they could be. One student remarked, "Listening to everyone’s stories helped ground us more firmly in the community and grow in relationship to each other. It was wonderful to see everyone in the circle open up, and it reminded me that The Vine is a ministry where we can bring our whole selves, where we can laugh together, and be vulnerable together." The group included students from The Vine's LaMP and PRiSM branches. 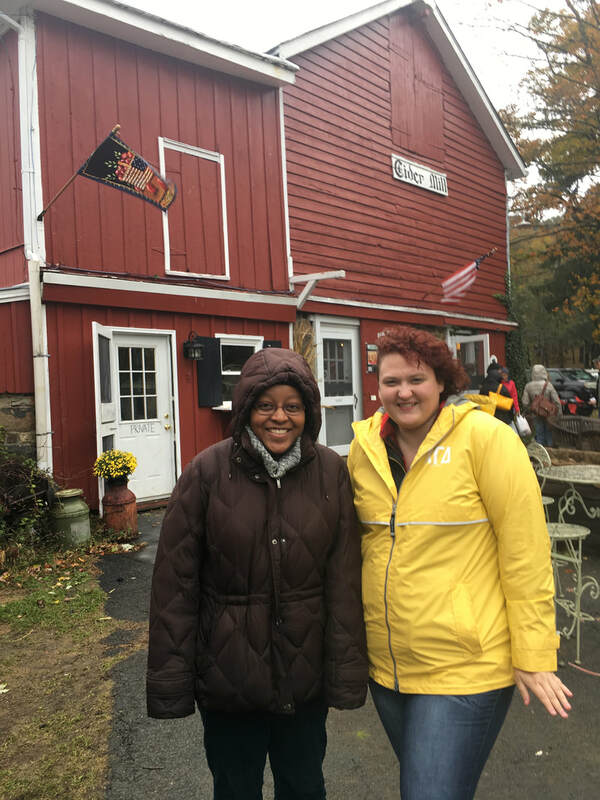 Students visited a cider mill for tasty donuts and warm apple cider. Columbia senior and Los Angeles native, Alex McNab, studied abroad in China during his junior year. Alex McNab loves food. A Los Angeles native who grew up eating and eventually working in his father's restaurant, he believes in the power of a meal to nourish body and soul and to build community around the table. Alex first encountered LaMP, The Vine's branch in uptown Manhattan, during one of LaMP's regular Late Night Study Breaks. These Study Breaks welcome hundreds of students into Broadway Presbyterian Church during midterms and finals for nourishment and rest in the midst of a stressful season. These events offer free food, live music, prayer stations, a chance to serve neighbors in need and, of course, all the coffee you can drink. Drawn in by the promise of all you can eat tater tots during a Study Break back in fall 2016, Alex discovered more than a tasty meal-- he found a loving community. Soon thereafter, Alex began attending LaMP's regular Monday Night Dinners and became an active participant in the ministry. While he continues to enjoy the home cooked meals, he is also grateful for the spiritual nourishment he has gained through conversations about faith, scripture, and life, and through the rich friendships he has formed in the past two years. 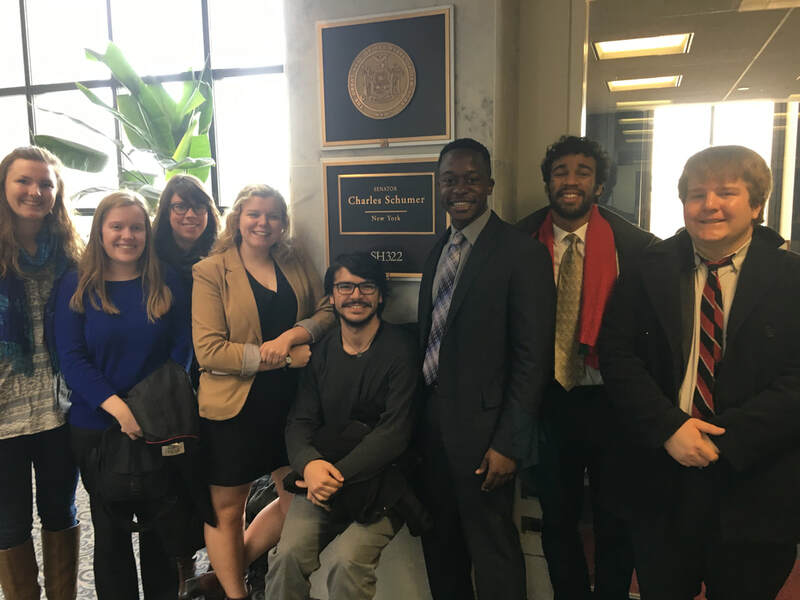 He also had the chance to take his love for food and care for his neighbors to Washington D.C. on The Vine's faith-based advocacy trip in 2016, during which he spoke passionately to policy makers about student food insecurity and the biblical injunction to feed the hungry. Many students like Alex have first connected to our campus ministries through hospitality and care events like Late Night Study Breaks. We are grateful to be able to make God's free grace incarnate for students by setting an abundant table where all are welcome and we give thanks for students like Alex who bring such amazing gifts to our communities! On October 14, alumni of the Queens College Lutheran Club gathered for a homecoming reunion on campus. 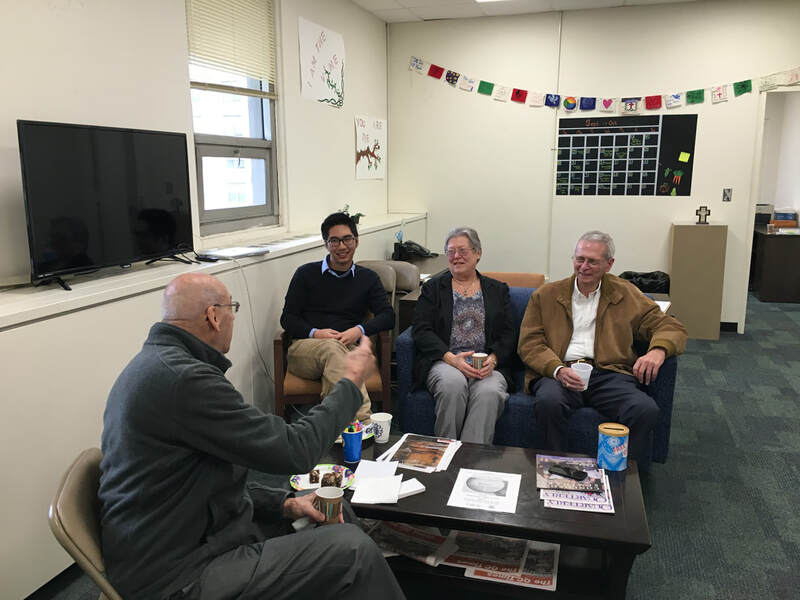 Former students came together over coffee in the club office to reminisce about their formative experiences with campus ministry in the 1950s and 1960s and learn about the Lutheran Club's current incarnation: The Vine QC. Campus minister, Anna Lutz, and current student, Lian, showed a student-made outreach video and filled the alumni in on what's happening these days -- from bible studies to international food lunches to multi-faith learning events with the campus Hillel and Newman Club. Although the programming may be different now than it was 50 years ago, the heart of the ministry is the same: "Then or now, it's all about relationships," reflected Rich Stewart '65. 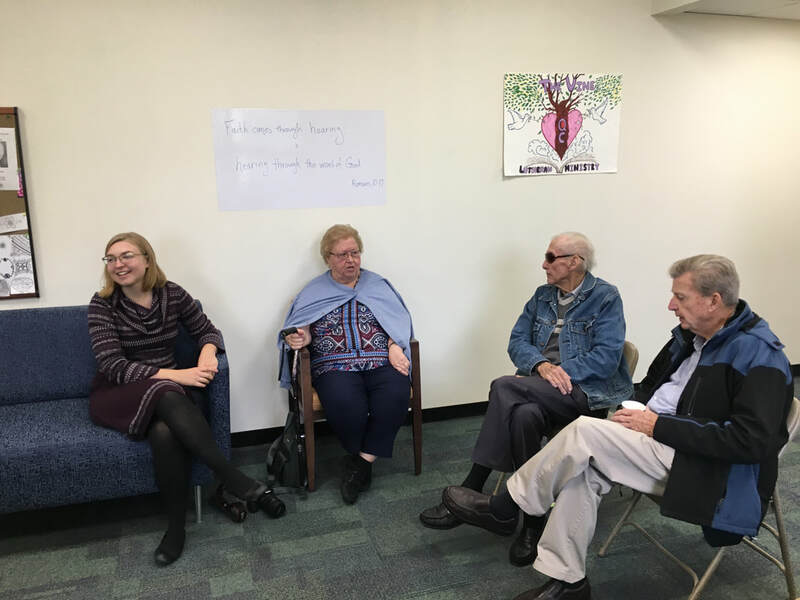 Stewart and other alums talked about the impact of those Lutheran Club relationships on their lives, from pastors who formed them in faith to lifelong friendships made there to the many spouses who met through the ministry to their ever deepening relationships with Jesus. What a blessing it is that after so many decades, students continue to experience and be transformed by the unconditional love of God in campus ministry community at Queens College! Campus Minister Anna Lutz chats with Lois Schneider, Rob Boehm and Don Krug. Bob Riekert shares a story with current student Lian, Carol Hering and Rich Stewart. During this past election season, we saw several history-making candidates. One of these included the candidate for governor of my home state, Idaho. Had Paulette Jordan won, she would have been the first Native American governor in the country and the first female governor of Idaho. I took it upon myself to join Jordan’s team of virtual phone bankers, and I learned a lot through this experience. For one thing, phone banking taught me to have a strange kind of courage – the courage to express my beliefs and hopes even if it ends with someone hanging up in the middle of my sentence or worse, yelling at me from the other end of the line. It also led me to the realization that there is a multiplicity of different ways to express my Christian faith. It’s not just about going to worship services and singing and receiving communion, important as those things are. It’s also about spreading the energy and inspiration my faith gives me to all aspects of my life. It's about bringing my faith into politics, academics, and other spheres of my life. It's about using my faith to advocate for the kind of change I want to see in this world. It's about letting my faith guide my understanding of what that change looks like. Thank you, Michelle, for your thoughtful reflections and inspiring us with your faith put into action! Like many congregations, Emanuel Lutheran Church in Pleasantville, NY has a wonderful tradition of sending care packages to its young members who are away at college. However, instead of using the postal service, Emanuel has its own very special delivery person in the form of their pastor, Paul Egensteiner. The idea first came up in 2007 when the congregation was discussing how to raise money to ship the packages and Pastor Paul was suddenly inspired to deliver them instead. Pastor Paul has been road tripping to take care packages to students in person for over a decade and in that time, he has traveled thousands of miles to bring a tangible sign of love from his congregation to its students. This year, Pastor Paul drove 2,000 miles, visiting 14 students at 12 colleges. He takes a selfie at every stop. Pastor Paul shared, "The mere fact that I show up on their campus with no expectation but to share love and concern with them makes them feel valued. I remind them, “God loves you and so do we.” One mom whose son I visited this year said to me, 'You know, he will always remember that you came to campus to see him.'" Thank you Pastor Paul and Emanuel for your amazing ministry to students! While not every pastor will be able to visit each student away at school, when it's possible, an in person visit from a pastor or member of the congregation can make a big impact on students who may feel homesick or isolated from their faith community. Click here for more ideas for how your congregation can support its college students year round. Have a great tip for how your congregation cares for its students? Let us know!